Islet macrophages reside in the perivascular space next to islet blood vessels. They are long-lived and self-renewing, maintaining about two to ten macrophages per islet . However, more than three decades after the first description of islet macrophages , our knowledge regarding the biological role of these cells is limited (reviewed in ). Emerging evidence indicates that islet macrophages are important for islet homeostasis and secrete numerous factors that modulate beta cell activity. Reciprocally, in this issue of Diabetologia, Weitz et al demonstrate that a factor secreted by beta cells is sensed by islet macrophages , revealing the possibility of a physiological, two-way dialogue between islet macrophages and pancreatic beta cells (Fig. 1). Perhaps the most well-recognised relationship between islet macrophages and beta cells is a deleterious one: the contribution of islet macrophages to islet inflammation and beta cell death and dysfunction in both type 1 and type 2 diabetes. Macrophages and proinflammatory cytokines are increased in the islets of individuals with type 2 diabetes [5, 6]. In response to various danger signals that are elevated in diabetes, including toll-like receptor agonists, NEFAs, endocannabinoids and islet amyloid polypeptide (IAPP) aggregates, to name a few, macrophages secrete proinflammatory cytokines [7, 8, 9, 10, 11]. Beta cell dysfunction during islet inflammation is mediated by several cytokines, including IL-1β and TNFα, for which islet macrophages are the primary source within inflamed islets . Macrophages are also important effectors mediating beta cell death in models of type 1 diabetes [13, 14]. Collectively, this has earned islet macrophages a ‘bad guy’ reputation in the islet. Though partaking in beta cell demise in pathological conditions, islet macrophages can also support beta cell function and proliferation. For example, while chronic exposure to IL-1β secreted from islet macrophages during inflammation is toxic to beta cells, acute, low concentrations of IL-1β have an insulinotropic effect on beta cells and play an important role in augmenting insulin secretion during acute stresses and in the postprandial state [15, 16]. Like other resident macrophages, islet macrophages are also likely to be important in phagocytosing dead or dying cells and debris and maintaining islet cell homeostasis. Islet macrophages continuously sample antigen from beta cells  and, through surveying the blood vessels and islet milieu for danger signals and invading pathogens, also act as an important first line of immunological defence. Mice lacking tissue resident macrophages have reduced beta cell mass  and, more recently, macrophages have been found to play an important role in beta cell proliferation and regeneration in models of acute beta cell loss [19, 20, 21]. Many proliferative factors are released by macrophages, among them transforming growth factor β (TGFβ1) and EGF, which were reported to mediate beta cell regeneration following pancreatic duct ligation . Moreover, macrophages were shown to be crucial for beta cell proliferation following vascular endothelial growth factor-A mediated beta cell reduction , and for beta cell regeneration mediated by connective tissue growth factor following pancreatic ductal ligation . Whether it be inflammatory cytokines in diabetes, or proliferation cues under regenerative states, the islet macrophage clearly provides numerous signals that modify beta cell behaviour and survival. This begs the question, do beta cells talk back to islet macrophages? 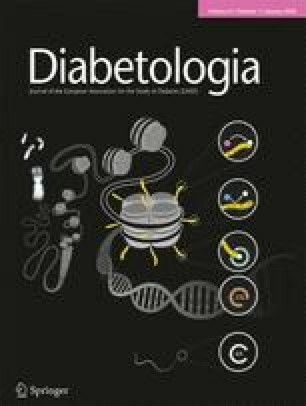 Evidence exists for chronic beta cell-derived cues that macrophages respond to, including the accumulation of IAPP aggregates in type 2 diabetes, which induce a robust inflammatory response [8, 9, 12]. Intriguingly, intact insulin granules have also been observed within islet macrophages, indicative of an intimate interaction between these cell types . In this issue, Weitz et al  use an innovative technique to probe a simple question: which, if any, pancreatic cell-derived signals acutely activate islet macrophages under physiological conditions? The authors developed and employed an in situ imaging technique by which intracellular calcium responses in pancreatic macrophages were visualised in live pancreas slices, using mice that express a fluorescent calcium indicator, GCaMP3 (a green fluorescent protein [GFP]–calmodulin fusion), following Cre-mediated recombination. The authors used several myeloid-lineage Cre lines to induce GCaMP3 expression in macrophages, and examined macrophage calcium responses in live pancreas slices under a range of stimuli. Under high glucose concentrations to stimulate insulin secretion from beta cells, Weitz et al found that calcium signals were activated in pancreatic macrophages, indicating activation by a factor secreted by beta cells. This was mimicked by application of KCl to induce secretion from islet endocrine cells. The authors verified that activation was dependent on beta cell secretion by applying an inhibitor of L-type voltage gated calcium channels to inhibit insulin secretion, which prevented glucose induced activation of islet macrophages. To elucidate the beta cell-derived signal responsible for activation, the authors applied ATP, γ-aminobutyric acid (GABA) or serotonin (all of which are co-released from insulin granules) to pancreas slices. ATP, but not GABA or serotonin, mimicked the activation of pancreatic macrophages by high glucose. Similarly, purinergic receptor agonists were found to elicit macrophage calcium responses, and several purinergic P2Y and P2X receptors were highly expressed on sorted (GFP+ and F4/80+) islet macrophages. Importantly, the activation of pancreatic macrophages under high glucose conditions was blocked by co-application of the purinergic P2 receptor antagonist, suramin. Islet macrophages also responded more potently to high glucose than acinar macrophages, consistent with these cells being exposed to greater ATP concentrations because of their proximity to beta cells. Taken together, these findings reveal that ATP, co-released from beta cells during insulin secretion, activates islet macrophages in a paracrine manner through purinergic receptor signalling. The findings of Weitz and colleagues imply that, through the co-release of ATP from insulin granules, macrophages may be able to acutely sense beta cell secretory status. Owing to islet macrophage paucity relative to other islet cells, studying these cells is challenging and generally requires an isolation procedure to enrich for islet macrophages, adding the risk of altering macrophage phenotype and behaviour. A major strength of the current study is the use of in situ imaging, leaving the resident islet macrophages within their intact environment. Furthermore, this study examined islet macrophages under normal conditions, whereas most studies have focused on models of inflammation, autoimmunity or beta cell injury. The next obvious question from this study is what is the response of islet macrophages to beta cell-secreted ATP, and what is the physiological role of this signal? The authors performed a cursory examination of the impact of acute ATP signalling in sorted islet macrophages, and found decreased expression of the gene encoding matrix metalloproteinase (MMP)-2 (Mmp2). ATP also elicited increased pseudopodia movement of macrophages, but this effect was not observed under high glucose, suggesting that this is not an effect of ATP secreted from beta cells under physiological conditions. Purinergic signalling has been shown to acutely modify macrophage activity in other tissues (reviewed in ), but further study is needed to elucidate the role of ATP sensing in islet macrophages. According to current knowledge, monocytes and macrophages express ionotropic P2X receptors and G-protein-coupled P2Y receptors . In human monocytes, genes encoding the P2X receptors P2RX4, P2RX1 and P2RX7, and the P2Y receptors P2RY2, P2RY13 and P2RY11 are highly expressed . In murine islet macrophages, Weitz et al detected expression of P2rx4, P2rx7, P2ry2, P2ry6, P2ry14, and the P1 receptors Adora1, Adora2a, Adora2b and Adora3 . These purinergic receptors are involved in a variety of macrophage responses. For example, P2X7 receptor signalling is implicated in the maturation and release of IL-1β/IL-18 via the NACHT, LRR and PYD domains-containing protein 3 (NLRP3) inflammasome , the release of prostaglandin E2 (PGE2) and MMP-9 [26, 27], and together with P2X4 receptors, the regulation of autophagy . Many of the P2 receptors are responsible for intracellular calcium increase . Furthermore, these receptors are sensors of so-called ‘find-me’ signals from cells that are in distress and can propagate further chemotactic and excitatory effects on immune cells . The study by Weitz et al in this issue of Diabetologia  identifies ATP as an acute paracrine signal released from beta cells that activates islet macrophages, thus revealing the possibility of an ongoing, two-way dialogue between beta cells and islet macrophages. As this study focussed on calcium responses in macrophages, it is possible that beta cells also provide calcium-independent cues to macrophages. There is still much to understand about the interaction between beta cells and islet macrophages, but it is becoming increasingly clear that macrophages are important partners in islet homeostasis, playing an ongoing role in beta cell health and disease by communicating with and receiving signals from beta cells. How the dialogue between beta cells and islet macrophages proceeds throughout life, and the implications of this complex interaction, remain a warranted yet underexplored frontier, pursuit of which will hopefully be stimulated by this elegant study by Weitz and colleagues. Work in the authors’ laboratories is supported by the Canadian Institutes of Health Research (CIHR), the JDRF, and the Stem Cell Network. HCD was supported by a JDRF Postdoctoral Fellowship and a Diabetes Canada Postdoctoral Fellowship. DN was supported by a Vanier Canada Graduate Scholarship. CBV is supported by an investigator award from BC Children’s Hospital and the Irving K. Barber Chair in Diabetes Research.